Now, Ford Expedition passengers no longer have to watch movies on laptops or other devices during long journeys. The proprietary Ford Dual-Headrest Rear Seat Entertainment System does away with this need by offering rear seat occupants access to high-resolution video screens. These specialized screens allow occupants to watch optical media, play games, or even stream video from their devices. 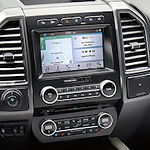 Another comfort promoting feature is the Ford Expedition Bang & Olufsen sound system. This high-end system offers vehicle occupants the luxury of sound that is distributed from 12 well-placed speakers.